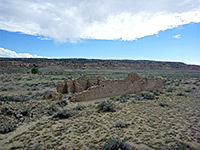 Although short (1.5 miles) and level, the route to Wijiji pueblo - one of the four backcountry trails in Chaco Culture National Historical Park - is not often hiked since the ruins are smaller than the other sites, the walk is somewhat monotonous being all along the floor of Chaco Canyon, and because the trailhead is rather inconspicuous, not on the main loop road. 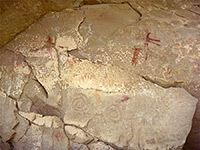 But the ruins are still evocative, like all others in the area; a mix of broken irregular walls and neat angular corners, while added interest is provided by some red pictographs and faint petroglyphs, on the canyon walls just to the north. Past Wijiji, the trail - an old vehicle track - continues to several other ancient sites but this section of the park is off-limits to hiking. Map of Chaco Culture National Historical Park. The Wijiji Trail begins 1.4 miles from the northern park entrance along road 7950, right opposite Gallo Campground, from a small pull-out with space for just a few vehicles. A very short path heads southwest through piles of fallen boulders then joins the old roadbed, now also used as a cycle route. This rounds a protruding section of the cliffs and veers east, following Chaco Canyon upstream. The gorge is half a mile wide, and flat, with a floor of hard baked mud and sand, covered by sparse, uninteresting vegetation. 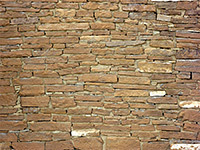 The path is not particularly close to the canyon walls, which are relatively low (200 feet), yellow to light brown in color, formed of Menefee Formation sandstone, and conceal a number of rock art panels. The surroundings are little changing over the next 1.3 miles to the ruins, which appear only when close up, being hidden by a curve in the cliffs and a slight incline. Past the site, the continuation track is blocked by a gate and No Entry sign. The ruins too are fenced off and have more warning notices, advising against entering the rooms or walking on the walls, unlike some of the stabilised sites like Chetro Ketl and Pueblo del Arroyo where sections are open for exploration. Wijiji is fairly small by Chacoan standards, containing about 40 recognizable rooms (the original total is nearer 225 rooms), built using a subtly different, more uniform masonry style, reflecting the more recent construction (1100 AD) compared to the downstream sites. 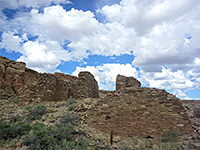 The pueblo is the most symmetric of the settlements on the floor of Chaco Canyon, suggesting that it was built all at the same time, not enlarged incrementally. The central plaza and multiple kivas which characterize the larger sites are absent here. A spur path forks off behind the ruins for 0.2 miles to some handprints, red pictographs and animal petroglyphs, all about 20 feet up on a cliff face. 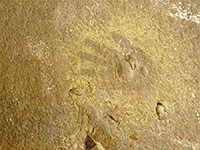 Visitors are not meant to stray from the path but the rock art is difficult to see properly unless approaching closer.